ACLU Posts Fed-Collected 'Suspicious' Activity Reports Online Document requests by the ACLU of Northern California have produced an inside look at the records of suspicious activity reports gathered by federal authorities. The feds appear to be keeping files on people based on tips that fall far below the threshold of reasonable suspicion. In the last few years, the feds have expanded efforts to collect tips about people's behavior in the real world. 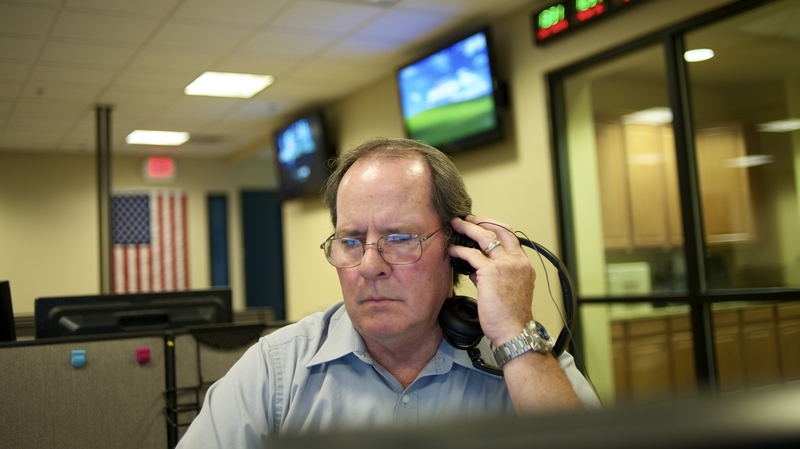 At a fusion center in Las Vegas, workers like Daniel Burns, a program coordinator, analyze suspicious activity reports. The ACLU on Thursday posted more than 1,800 of these reports that were gathered in central California. With all the talk of spying by the National Security Agency, it's easy to forget the government engages in off-line surveillance, too. In the last few years, the feds have expanded efforts to collect tips about people's behavior in the real world; they're called suspicious activity reports. Hal Bergman, a freelance photographer in Los Angeles, has a fondness for industrial scenes, bridges, ports and refineries. "They're large and they're hulking and they're utilitarian and they look interesting," he says, "and they are spewing steam and I find that visually fascinating." The problem is Bergman's fascination raises suspicions. He's routinely challenged by security guards and police officers — even when he's shooting on public property. Most of the time, the officials accept his explanation, but every now and then, they report him to the feds. Once, two FBI agents showed up at his door, wanting to know what he'd been up to at the Port of Los Angeles. "I show my portfolio. I show 'em what I was shooting. I may have shown 'em what I shot that day. And after five minutes of this, what felt like a really tense interrogation, they got really friendly. They realized I was harmless," Bergman says. A year later, one of the same agents called him again, following up on another report. Bergman said the agent already knew he wasn't a threat, but he couldn't close the file until he'd asked him certain questions. "He said to me, 'Do you hold any ill will toward the United States of America?' And I said, 'No, no I don't." And he says, 'OK.' "
What a waste of time says Mike German, who spent 16 years in the FBI. "This is a system that is dulling the response, rather than helping," he says. German is now senior policy counsel at the ACLU in Washington, D.C. His organization has obtained more than 1,800 of these suspicious activity reports, gathered in central California. The ACLU got the reports through public records requests and posted them online. They're a fun read. You can see all the reports of suspicious people taking pictures of dams. But there's also the two Middle Eastern men who bought $1,700 in cigarettes. There's the Sikh with the suspicious tattoo. And there's the inmate in Sacramento who was caught with a drawing that reads: "I Hate America." "What we see here with these reports is that they are being based on people's political speech in some cases," German says. "And people's other First Amendment activity, like photography, and often based on their religion." German says this violates a federal regulation that prevents police from sharing derogatory information about people if that information falls short of a reasonable suspicion of a crime. He says this program "dumbs down" the very concept of reasonable suspicion. "There are certainly bad people out there who are intending to do harm. But the question shouldn't be: Do we respond to every single time somebody says somebody's doing something wrong? Or do we actually triage our work somehow based on evidence," German says. The Nationwide Suspicious Activity Reporting Initiative is led by the Justice Department. NPR tried without success to talk to officials there about the program and the ACLU's criticisms. Last March, the Government Accountability Office faulted the program for not being able to track its own effectiveness. Meanwhile, the system is growing — fast. The GAO says 53 federal agencies now participate, in addition to the regional fusion centers where the information is collected. And it all leaves photographer Bergman wondering what they're doing with the reports on him. "Am I going to have problems at the border?" Bergman asks. "Are they going to take my laptop when I come back in the country? It makes me nervous that I'm not committing a crime, and the government is building records about what I'm up to." He says it's a little like middle school, when you're left wondering what it is that's going on your permanent record. The audio of this story incorrectly refers to the GAO as the General Accounting Office. Previous Web versions mistakenly called it the General Accounting Office and the General Accountability Office. The correct name is Government Accountability Office.